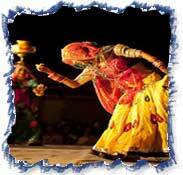 The Rajasthan International folk festival (RIFF) is India's first annual folk festival which celebrates the traditional Folk Music and Arts. 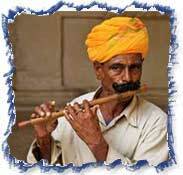 The festival is organized to offer an open platform to all the musicians and folk artist from India and around the world. More than 250 musicians and art performers from Rajasthan, India and Overseas get together and celebrate the traditional folk music and art heritage, creating innovative collaborations with an exciting fusion of International and Indian Folk Music accompanied by exciting performances. 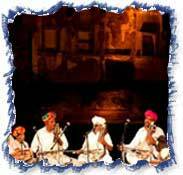 The RIFF Jodhpur organizes a series of programs, concerts and events based in and around Mehrangarh Fort. The festival is timed to harmonize with the brightest full moon of the year in northern India which is called 'Sharad Purnima'. 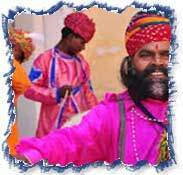 During this festival the Mehrangarh Fort is decorated beautifully. 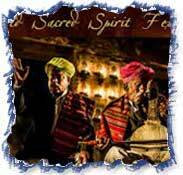 Set against the backdrop of the Mehrangarh Fort, the Rajasthan International Folk Festival in Jodhpur comprises of impressive performances by some of the greatest musical maestros from local Rajasthan communities and across the world. 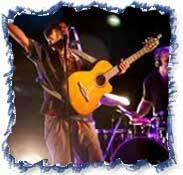 The festivities showcase sensational star acts each night. 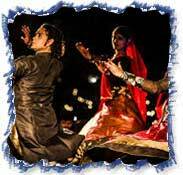 The festival will also feature events like a Rajasthani night, a Jazz night, Traditional and Gypsy dance forms, early morning Ragas, etc. Interactive daytime sessions for visitors, school children and families are also organized. Meeting and assistance on arrival & transfer to hotel. Morning after breakfast proceed for a combined tour of Old and New Delhi. First stop is the Red Fort built by Emperor Shah Jehan. Next visit the great mosque - Jama Masjid. Then walk around the lanes of quaint Chandni Chowk. Drive on to see the Mahatma Gandhi memorial at Rajghat. Later explore the Qutab Minar- built in 1191 AD. Close by is the famed 2000 year old Iron Pillar. Continue to Mughal Emperor Homerun’s Tomb. A drive through Delhi's tree - lined avenues takes you to India Gate - a memorial to the Unknown Soldier, the Rashtrapati Bhawan (residence of the President of India). Morning after breakfast proceed for Agra via Sikandra - the mausoleum of Akbar. Akbar himself started construction of this beautiful monument. This structure has a perfect blending of Hindu, Christian, Islamic, Buddhist, Jain themes. On arrival check in at hotel. Afternoon visit Agra Fort, the red sand stone building nearly one kilometer long imposing building, possess the Halls of Public and Private Audience and the Tomb of Itmad-ud Daullah. Early morning take a breathtaking view of Taj Mahal. It was built in 1630 by the Mughal emperor Shah Jahan in memory of his wife Mumtaz Mahal. After breakfast proceed for Jaipur enroute visiting Fatehpur Sikri, the old Mughal capital (40 kilometers) from Agra. This magnificent fortified city was built by Emperor Akbar in 1569 and became the capital of Mughal India for 15 years. On arrival check in at hotel. Morning after breakfast proceed for excursion to Amber Fort on elephant back. 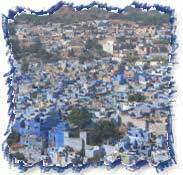 The fort was completed in 1592 by Raja Man Singh and is a true example of Rajput architecture. Proceed to city palace which has a wonderful collection of Rajput heritage such as weapons, enamel ware, carpets and art items. Then move to the observatory and finally drive past Hawa Mahal. Morning after breakfast proceed for Jodhpur. On arrival check in at hotel. In the evening take a leisurely walk around the old city. Morning after breakfast proceed for Udaipur enroute visiting the famous Jain Temples of Ranakpur a big pilgrimage centre for the Jains. Admire the workmanship from the 16th century. The temples are built out of marble and the main shrine of Adinath with 1444 columns is awe inspiring and none of these are similar. Also see the sun temple and the other temples in the campus. On arrival check in at hotel. Morning after breakfast visit the City Palace Museum- grandeur and intricacy stroked all over in granite, marble and mosaic displayed in the sparkling white filigreed balconies and windows, ornate arches and cupolas atop magnificent octagonal towers, Jagdish Temple- built in 1651 AD. Also visit Sahelion Ki Bari- the spectacular garden displaying the antique life style of the royal ladies who once lived in the places. Afternoon at leisure. In the evening enjoy a most memorable boat ride with the reflections of the majestic Lake Palace Hotel at its best against the setting sun. Morning at leisure. Afternoon transfer to the airport to board flight for Delhi. On arrival transfer directly to the international airport to board flight for your onward destination.